T@3 takes place on the 3rd Sunday of each month, from 3pm in our church hall at Stewartby United Church. Access is through the main church doors. Afternoon tea is normally served at approximately 3.10pm, including sandwiches and cakes, elegantly served on cake stands. Our time together generally ends around 4.15pm. The aim is, in a relaxed atmosphere, to be able to chat with friends old and new, have a go at a quiz and listen to a short 'food4thought' with a Christian theme. Children can participate in their own activities if they wish, as well of course as enjoying the food, and for the older 'youth' there are activities in the church. There is no charge but a donation to cover costs would be much appreciated. 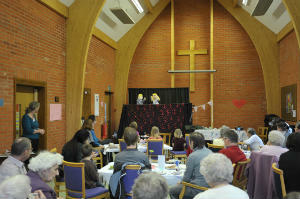 The photo shows an enthralled audience watching a puppet show, kindly performed by the puppeteers from The Vale Church. There's always something going on at Stewartby United Church and we aim to provide something for all ages. Whether you want to come to one of our morning services, or to T@3 for a beautiful afternoon tea you are very welcome. You can also hire our Church Hall. After our morning services we gather to have a drink and a natter, a great time to chat to friends old and new. Several organisations use our premises and would welcome newcomers to their activities. This term we are looking at "The Big Picture" - a series of discussions/study, taking us through the Bible from creation to eternal life! A good opportunity to see how everything fits together from beginning to end. No previous knowledge needed. Everyone welcome. Based in Stewartby. Starting at 7pm. Please contact Elaine on 01234 767057 for further details. If anybody is interested in joining a small group to ask some of those big questions of life, and to see how they relate to the Christian faith (who are we? where did we come from? why are we here? where are we going? why is there so much suffering in the world? what's Jesus got to do with all this? ), please get in touch - we'd be really happy to start one up.